In this three-part series, we are interviewing National Hispanic Institute alumni who have who have declared for United States Congress in the 2018 elections. 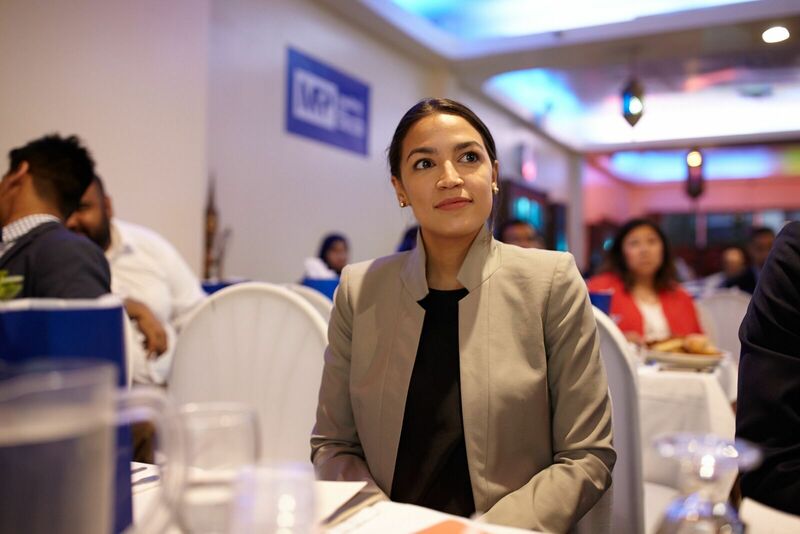 This final installment is an interview with Alexandria Ocasio-Cortez, an educator and activist who attended the National LDZ in 2005 and the New York CWS in 2006. She will be Educational Director for the upcoming Northeast CWS at Cabrini University. Alexandria Ocasio-Cortez is running for office in New York’s 14th Congressional District. First of all, why you did decide to run for Congress? Running for Congress was not a planned venture. My community engagement, activism, and life experiences led me here in a rather unexpected way. Years ago I worked for the late Senator Kennedy, but quickly exited politics after disliking the influence of money and dynastic power in our political system. I tried to focus on social entrepreneurship and community work instead. After the recession hit and my family was in danger of losing our home, I turned to the service industry to help make ends meet. That all changed last year, when I helped organize the Bronx for the Bernie Sanders campaign. After the election some friends and I hopped in a car and began sitting down with everyday people across the country to explore pressing issues facing our communities: we went to Flint, MI; Standing Rock, South Dakota; and Puerto Rico. To be honest, I didn’t quite know what doors I was opening then. I was following my instinct. When I got back from those travels, I got a call from Brand New Congress regarding my nomination for a congressional run. There would be no big money or backroom deals involved – it would be an all-grassroots effort to move the nation forward. It felt like exactly what the country needed and the right thing to do. You’re part of the Brand New Congress movement — can you talk about that a bit and why you got involved with it? Brand New Congress is a national effort to mount 300+ non-politician primary challengers in the 2018 midterm elections. We are grassroots, post-partisan, and accept no special interest or SuperPAC money. We do not run career politicians and are primarily driven by the need to get money out of politics. We seek to advance an ambitious, no-nonsense legislative agenda that has broad consensus among the American people. That means we are running Republicans, Democrats, and Independents alike. So long as a candidate commits to our platform, we do not discriminate based on the party letter next to their name. There is no way I’d be running without the support of Brand New Congress. My goal is to create impact, and the best way of doing that is by joining a national movement of people committed to a mutual goal. It emboldens me to run with individuals like Cory Bush in Ferguson, Paula Jean Swearengin in West Virginia, and Anthony Clark in Illinois. In a way I cannot imagine how a person can run a campaign all by themselves. With my fellow candidates and the BNC team, I feel plugged into a larger movement every day. I can celebrate their wins on my tough days and vice versa. We encourage each other. Once we get elected as a cohort, we will be able to wield power as a turnkey movement of honest, everyday people looking to make Congress accountable again. You’re running in the 14th District in New York, represented by Joe Crowley, who is a longtime Congressman and chair of the House Democrats. What would you say to people who wonder if you can be a better Representative than someone with so much experience? My opponent was appointed the seat through a deadline loophole 20 years ago and has never been primaried since. Since then he’s raised $3 million a year and uses that money to amass influence and bring other House representatives under the corrupting influence of special interests. That’s not the kind of experience that is beneficial for everyday people and it’s certainly not the kind of expertise we need in Washington. It belongs in Wall Street and can stay there. Unlike my opponent, I actually have experiences contributing to the community I seek to represent. I have organized here, educated here, and worked to make ends meet here. In addition to that on-the-ground experience, I have the policy expertise and the political will to champion legislation that the lobbied and entrenched establishment has been too scared to back for fear of losing their patronage. Our most exciting win of the campaign thus far is in forcing Crowley to scramble onto signing HR676: Medicare for All. He has opposed dignified healthcare for twenty years because of his outsize amount of health insurance lobbying. Two days after we announced our primary challenge championing that same legislation, he was forced to flip. Our campaign delivered a cosponsor on Medicare for All in its first week. We are better suited to represent everyday people because our hands are not tied by special interests. What did you learn about NHI that you’re taking to this race? NHI has helped me a great deal in framing how I think about service and leadership. Money, power, and status are all short term means. Legacy is your end. Impact is your goal. Values are the most important compass of all. My experiences as an Educational Director and organizing through NHI has also shaped much of how we’re building our campaign for NY-14. It’s important to me that we focus on an asset point of view: emphasizing our progress, championing the positive, and celebrating people’s contributions – no matter how large or small. Everyone matters and has something valuable to offer. We also aren’t afraid to ask tough questions, demand more from each other, and push to achieve more. That DNA is magnetic and much more inspiring than the desperate fear and negativity that has traditionally run so many other political campaigns. What would you do in Congress to truly make a difference? We have an ambitious policy agenda that champions the middle class and seeks to get money out of politics. You can read the entire platform here. But in addition to bold policy, there is a largely untapped cultural power that we have as members of Congress. We can inspire change by showing people what we achievements are possible when we all come together and organize on a massive scale. By inspiring dinner conversations, authentically engaging with our communities, and speaking openly and honestly about the most pressing issues facing our families, we can transform the discourse of this nation. And that impact can last far longer than any single bill in committee. To learn more about Alexandria Ocasio-Cortez and her campaign, visit her campaign website, like her campaign’s Facebook page, and subscribe to her Twitter account.